Cage Tippers are a great alternative to regular tippers, with their added cargo support and increased hold capacity by utilising the cage structure. 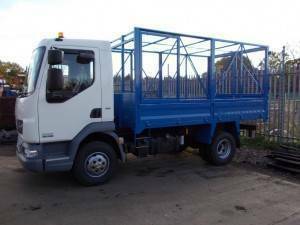 They have a lightweight tipper body with a full cage and tipper, making them effective and efficient for building and trade work. Often hired by the building industry due to their versatility regardless of the size of the project, they can also be used for transporting garden waste or household waste if you’re in the middle of renovating your home. Our cage tippers adhere to Driver and Vehicle Standards Agency rules and regulations, ensuring the safety of the operator and the general public whilst the cage tipper is in use. At ND Brown, we have a number of depots across the United Kingdom, including the West Midlands, the London area, Scotland and Northern Ireland. This means we’re placed strategically so that we can provide cage tippers across the country to any project that requires them. We can offer cage tippers on both long and short term self drive hires, and can drop off and pick up the vehicle so that we work around your busy schedule, leaving you to concentrate on the project at hand. We can also service and repair any vehicles that have issues whilst on a job. To discuss your requirements and hiring our cage tippers, please give our expert team a call who will be able to provide you with information regarding our hire packages, discuss the project you would require a vehicle for and offer informative advice about other vehicles that may be of use to you. Alternatively, you can view our locations and contact one of our specific depots so that the process is more efficient in the long run.